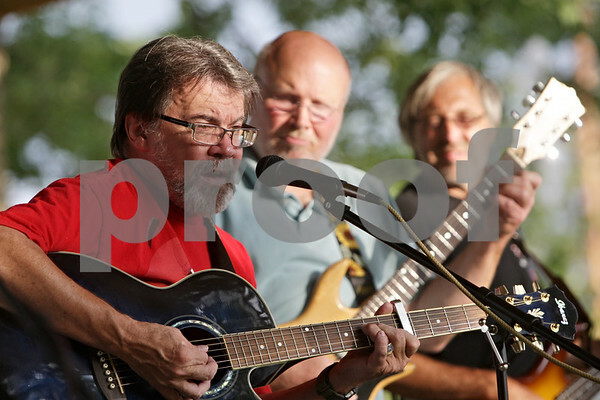 Kirkland mayor Les Bellah (front) sings and plays the guitar with his band, The Patchwork Volunteer Band, during the 4th annual Pickin' in the Park at Franklin Township Park to help raise for the Joe McGuan Scholarship fund, which provides assistance for the education of children and grandchildren of veterans. ***The other members behind Bellah are Dave Guzzardo (middle) and Jeff Dover. They aren't in focus so I left their names out, but if you think they should be added then please do so. Kirkland, Ill.